Make a statement with a unique name necklace! Our customizable name necklaces are a must-have for any savvy shopper or fashionista. 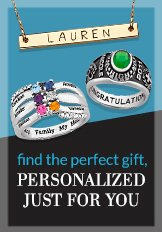 Shop through our hundreds of personalized name necklaces and discover sterling silver name necklaces, gold name necklaces, and even bar name necklace. Every Limoges name necklace is crafted with care and makes the perfect personalized gift for any occasion. A personalized name necklace does more than just tell the world who you are. It makes you proud and confident. At Limoges Jewelry, we understand the differences among customers when it comes to personality, style, and fashion statement. That is why we create necklaces specifically designed for each shopper. We can customize your necklace to suit you or your recipient’s taste.